"Tube Screamers is in a sense a classical rockband. The sound is unpolished and raw, and takes you back to the garagebands of the 60's and 70's, but also great current acts such as: BRMC, Foo Fighters, The Black Crowes and Ryan Adams has influenced them hugely. They produce original rock'n'roll music with nerve and skill, and are always searching for the next grooving rock tune to slowly take shape in the rehearsal room. As a live act there's only one thing to say: You must be there to really get it all in!!! They will deliver a show, that will leave you breathless and begging for more, just so you can get that last ounce of pogo out of your body. 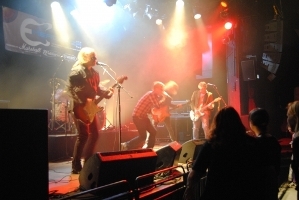 The five piece band hails from a medium sized suburban city in Denmark called Horsens, mostly famous for it's prison. It's from here Tube Screamers are trying to reach the world, and hopefully you will embrace them in their quest to keep delivering that great Rock'n'Roll music to everyone who wants to listen"
It's a hard question, there's so many great songs out there! A couple of years ago we were on a tour of Denmark, and at each venue, before every concert we would put on The Beach Boys' "Good Vibrations" as a warm up. It was our guarantee that the sun would come out. Another song could be "Go to California" by the Norwegian band Motorpsycho from their album Phanerothyme. This year we have played the Emergenza Festival, where we got through to the Danish finals, but unfortunately didn't win. We have played at a big harbor festival in Odense, Denmark, and are playing at an underground festival called StoneAss Festival, which is gonna be held at an old state prison. We have attended Roskilde Festival (we hope to play there next year), and are maybe going to Wacken Open Air in Germany, and Skanderborg Festival in Denmark. In music history the most remarkable summer was "The Summer Of Love" in 1967, when all the hippies went to San Fransisco, and the Monterey Pop Festival. It was a summer of music, love, acceptance, sharing, revolution, creative expression, sexual freedom, drugs and politics. So many things happened, good and bad. It was a time of revolution, and some of the greatest legends of music where there to make it even better! The Jimi Hendrix Experience, Big Brother and the Holding Company, The Who...the list just goes on. Playing gigs, drinking ice cold beer, cutting new tunes, going to festivals, relaxing in the sun...and oh, did we mention; drinking ice cold beer! !